Released in 1979, Ek Din Pratidin marked the beginning of a new phase in the career of Mrinal Sen yet in many ways this is far superior to his earlier work including Calcutta 71 and Interview. The story focuses on a middle class Bengali family in which the oldest daughter, Chinu (Mamata Shankar), is the sole breadwinner. One evening when she fails to return home, the family fears the worst. Events unfold over the space of a few hours and as the family awaits the return of the daughter, tensions amongst them come to the fore. The family lives in what is a large multi storey mansion and they pay rent to the despotic landlord who taunts all the tenants with the threat of eviction. The claustraphobic nature of the settings as most of it takes place within the confines of the house gives the film a particularly strong theatrical feel. 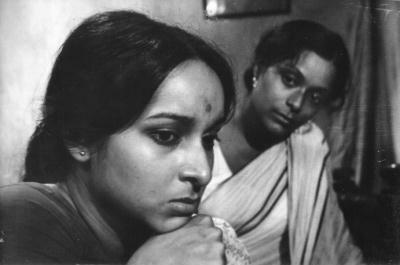 Like Ghatak’s Meghe Dhaka Tara to which Sen pays explicit homage is the concern with which the film explores the position of the working woman in a new Bengali society and the forces of conservatism and tradition that threaten to destroy her reputation. Like the best melodramas, Sen looks at both women and family whilst suggesting how both seem to dysfunction in the face of poverty. The daughter’s failure to return home provokes an angry response from the youngest daughter who accuses the family of harbouring a selfishness that exploits the familial sentiments of Chinu. It becomes shamefully apparent to both the father and mother that their daughters existence prevails solely to keep intact the structure of the family and to also sustain what dignity they have left. The search for Chinu leads her brother to hastily visit the local morgue in which he comes face to face with accident victims. It is a nightmarishly shot sequence and tellingly illustrates how their dilemma is not an isolated one and exists in a wider social malaise. This is repeated later in the hospital when Sen has potential relatives and family members directly address the camera as they wait to identify the body of a dead girl. When Chinu finally does arrive home safely at dawn, the landlord reacts angrily by threatening the family with eviction, citing the failure to maintain a level of moral decency as the cause of their supposed transgression. Perhaps in the most overtly political moment in the film, the son reacts violently, condemining the landlord as a hypocrite and a symbol of conservative ideology. Ek Din Pratidin is a remarkable film, underlining Sen’s urgency as both a political film maker and social commenator on Bengali society. I can see now why he is held in such high regard by critics and Sen deservedly earns his position alongside respective Bengali auteurs like Ray and Ghatak. 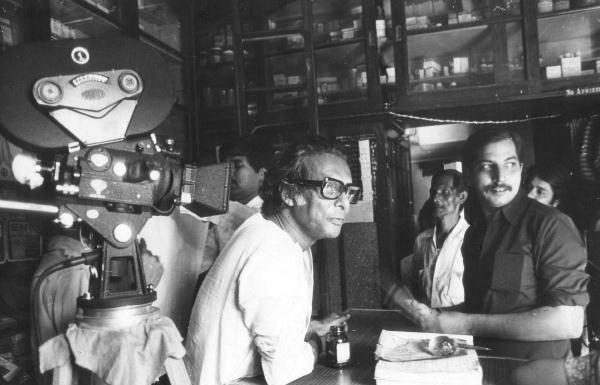 Now that Ray and Ghatak have both been given their dues as influential and key film makers in the realms of Indian Art cinema, Sen’s contribution and body of work still needs to be celebrated and analysed further. On a final note, Ek Din Pratidin was financed by the NFDC when the funding body was working at its peak. Currently, the NFDC website is asking for bids for the radical updating of their current website and also the introduction of a new VOD (Video On Demand) service. If both of these services come to fruition then it could potentially open up a whole new area of cinema and research that has often been inaccessible and marginalised. This series of posts on Indian cinema is top notch. Haven't been able to watch these films, but the posts are irresistible. As for NFDC, it's really imperative that they make the films they have sponsored available for general viewing. There is a TV channel in India called Lok Sabha that plays one NFDC movie every week. The films are really interesting. Great deconstruction of one of Mrinal Sen's acclaimed films. The movie indeed lays threadbare the inherent hypocrisy and prejudices in a seemingly civil society. Only in a time of crisis do these traits come to the fore. Like most of Sen's works, this too is a socio-political film; but here, the social aspect was far more dominant than the political aspect. Wow, one NFDC movie every week, if only I was living in India, damn it! Lok Sabha; is this a political channel? This entry was posted on February 16, 2010 by Omar Ahmed in Bengali Cinema, Indian CInema, Mrinal Sen, Parallel Cinema, Political Cinema.